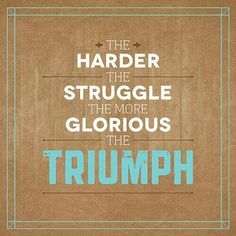 I love this quote that I saw recently “the harder the struggle, the more glorious the triumph” .. its true, and everyday when I work hard through my healing I fight for the glorious triumph on the other side. My therapist always says to me “we are getting to the other side, we are taking steps every day to find what life is like for you on the other side”. But sometimes I wonder, is there another side? or is this the life I am chosen to live “a life to fight forward”. Sometimes I am so tired of fighting! Some days I wake up and don’t want to fight forward, I want to just curl up, cover up, and sleep through the day! but I always move forward, and I always find that last ounce of something in me to fight! I am a fighter, and I always will be. I will always fight for what is on the other side even on the days I don’t want to get up and do the good deed of fight! But what I have learned in the almost 7 years of therapy is, even in those times it doesn’t feel like I have stepped over to the other side, I am a lot closer than I was years ago. It’s hard to see the big picture when you are IN the big picture….. sometimes you need to step back and take a look at where you have gone and how far you have come to appreciate where you are going, and the right to get there. Keep fighting for the other side, and one day you’ll find you’ve crossed over to it. Always a real treat to read!